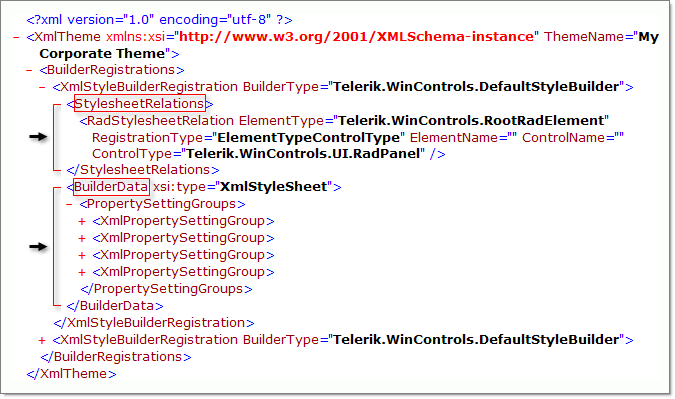 Telerik Presentation Foundation layout follows the W3Cbox model standard. The diagram below shows the basic structure and naming conventions of the box model. Content is the rectangular area where an element renders itself and places child elements. The RadElement FieldSize property provides the size of the content area. Padding is a rectangular area that surrounds the content rectangle and is typically filled with the background of the content area. The RadElement Padding property provides the rectangle dimensions, includes helper functions to perform math on two Padding objects (adding and subtracting) and has dimension properties for each side of the rectangle. Padding properties Vertical and Horizontal provide the sum of top/bottom, left/right padding areas. The border of an element is typically rendered by a BorderPrimitive child of the element. The RadElement BorderThickness property determines the area that is given for border rendering. Margin is the area outside an element. Margin affects the spacing between elements. For example, if an element with a non-zero left margin is next to an element with a non-zero right margin, the total margins is the sum of the two fields as shown in the figure below. Margins are always transparent. The RadElement __Margin__property is a Padding type and represents the rectangle dimensions. In the example below the control on the left has no margins. The control on the right has ten pixel margins.